Planners who work for the governments of Winter Park, Maitland, Orlando, Kissimmee, Casselberry Longwood, Orange County and Osceola County taking a health break at the first of a series of workshops that will provide education in best practices and assist in identifying necessary changes to current policies and practices to support Complete Streets. According to the U.S. Department of Transportation, roadways traditionally have been designed primarily for motor vehicles. This personal vehicle-centric design potentially could pose barriers to use by pedestrians, bicyclists and public transportation users, thus limiting active transportation opportunities and the resulting health benefits. Complete Streets policies can create opportunities for planners and engineers to develop roadway designs that improve the safety of all users and provide additional opportunities for physical activity. 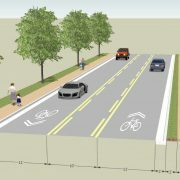 Winter Park Health Foundation (WPHF), Bike/Walk Central Florida (BWCF), MetroPlan Orlando, and Smart Growth America (SGA) are partnering to help Winter Park, Maitland, and other municipalities in the Orlando metropolitan area implement Complete Streets. SGA is scaling its current program with the Florida Department of Transportation (FDOT) at the regional, municipal, and county levels and providing a series of workshops to staff from Winter Park, Maitland, Orlando, Kissimmee, Casselberry, Longwood, and other areas in both Orange and Osceola counties. These workshops will provide education in best practices and assist the municipalities in identifying necessary changes to their current policies and practices to support Complete Streets. The workshops will also cultivate Complete Streets’ leadership within the participating agencies and support changes in decision-making culture.